Born in 1952 at Derby, the west Kimberley regional centre in Western Australia, Joel Smoker has been taking photographs since he was in primary school at Halls Creek. He started with a Box Brownie camera and then graduated to a Kodak camera that could shoot colour as well as black and white. He still has photographs in his collection that he took from his travels around the Kimberley as a boy. In 1983 Joel took up a position as an Arts Advisory Teacher with the Education Department, based at the Kimberley District Education Office in Kununurra in the east Kimberley. The job was for three years and Joel took his camera with him wherever he went. The result is a collection of images that document the landscape and the times during those years. 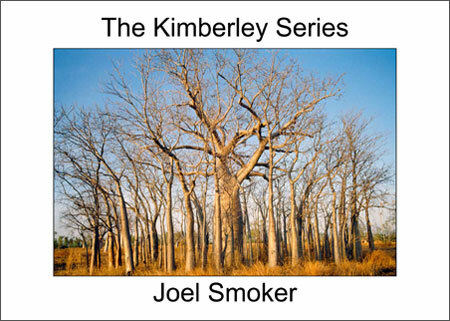 The Kimberley Series is a set of forty photographs selected from this collection. The Kimberley Series of photographs was first exhibited in 1987 at Birrukmarri Gallery in Fremantle in conjunction with an exhibition of art by artists from the Waringarri Aboriginal Arts Centre in Kununurra. The photographs have since been exhibited at Hogarth Galleries in Sydney in 1992 and numerous other exhibitions. They represent the vision of a native son. This quality A4 publication is bound in soft cover and makes an ideal gift or souvenir at $24.95. The Kimberley Series of posters, metalic prints and A2 prints are also available.